This project tried to defeat me not once, not twice but thrice and I vanquished with my super powers of seam ripping, freestyle cutting and binding. Read on if you dare…. 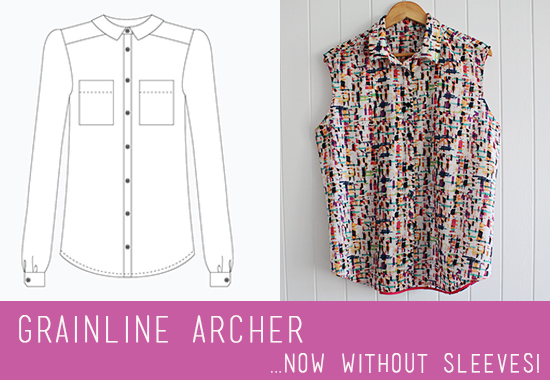 This button up number is the always-popular Archer Shirt from Grainline Studios. I went Version A again with the simple back panel but decided to axe the sleeves partway through construction. The fabric is a cheap and cheerful Japanese lawn scored from Spotlight on the throw out rack for $6 a metre. Score! Keeping with the Grainline theme, I used leftover buttons from my watermelon Alder frock. Thankfully this sucker is in a busy print that hides all mistakes because construction did not go to plan. I hadn’t intended to make it sleeveless and as such the pattern wasn’t adjusted properly. Oops! This means alterations were an exercise in going rogue where I freehand scooped 1.5cm out of the bottom of the armhole and brought the sleeve head in 2cm. There is some gaping at the back of the armhole (which is to be expected) but that is hidden by my cardi normally so it’s not too big of a deal. Plus, if I Hulk out unexpectedly one day my shirt should stay on so that’s a win! The collar proved problematic this time as I tried the instructions included with the pattern. My poor pea brain had issues with this order of steps and needless to stay things did not progress well. The poor collar stand was unpicked so many times that the fabric started to fall apart. In the end I folded the ends under, did some dodgy top stitching and figured if peeps could notice the problems in this print they were either a) standing to close or b) were secret ninjas sent to spy on me. To try and counteract my collar fail I had the bright idea of finishing the armholes using gold satin bias binding. Doh! Unfortunately the satin binding was way too bulky for the lawn and it was ripped out and replaced with the next most neutral binding in my stash – fuchsia. Unfortunately the removal of the gold binding and the super fine fabric (and probably my unpicking rage after the collar saga) means there were a few small holes in the fabric at the armhole. The binding has covered most of the holes with the rest fray-stopped into place. All hail the might powers of Fray Stop! Clear instructions. Well, except for the collar method. My brain just wasn’t working there and I will go back to using Andrea’s method next time. It’s a nice and simple button up. What’s not to love? I feel like there needs to be a third dot point because this looks uneven. So I’ll tell a joke: What is a T-Rex’s favourite number? Ate! Bwah ha ha! Use Jen’s tutorial for actually making the correct adjustments for a sleeveless Archer. Oops! Overall, this is a good wardrobe staple for work and it’s been on high rotation. In saying that, I have come to the conclusion that whilst I love the Archer on other people it is not quite what I am after with a button up shirt. I have been having a look around for some alternatives with darts for some bust and waist shaping and am excited to have a bash at Deer & Doe’s Bruyere and Melilot as well as Vogue 8772. I’ll be reporting in on those as I make my way through them. And in other news, El Husbando and I are back after five weeks in Peru where we had a blast. I’m still shaking a head cold I picked up after a horrid bout of jetlag but will have stories and pictures to share soon – including my tiny but mighty fabric haul! One photo I am sneaking in is when I reached Machu Picchu. This picture was 25 years in the making since my year five project on Peru. The 45km hike was challenging and amazing and humbling and after two years of solid physio, cardio and weight training to get me ready I freaking did it. Best feeling in the world. Great haiku but I agree no one will see the issues in the end. It looks fantastic! Huge congrats on the climb, that is no small feat! Congratulations on the climb! And nice saves on the shirt. That spotty lawn is really nice. Have you looked at the Sewaholic Granville? It has a bust dart, nice shaping in the back with the princess seams and a shaped waist, and a very cute collar. I’ve made it twice, and the second time I left out the back shaping for a more relaxed fit. All I read was “was going well until I made the mistake of following the instructions”. 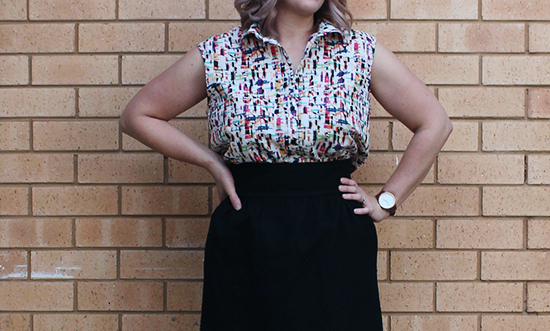 Shirts really can be tricky, the right pattern does make a big difference – I made a bruyere recently and loved it. Printed fabric is a godsend with dodgy stitching! I’ve just made a Bruyere and it is magic – thank you for the suggestion! That is a picture you are allowed to carry around with you at all times and shove into anyone’s face. Seriously. Wow trip of a lifetime! So cute that you obsessed over it since you were little…you look like you had a brilliant time from the insta pics I’ve seen. Also don’t worry, no secret ninja spies will be allowed to come within 5 metres of you. Hey Amanda, what do you call a dinosaur with no eyes? Doyouthinkhesaurus! Love the Archer and the hAiku! That fabric is gorgeous and I love your topstitching!! I love the Archer pattern, but my other favourite is the Sewaholic Granville. It has more shaping, and bust darts and is a bit more fitted all around. I’m excited to see the other ones you try! Thanks, Heather! You gotta love a bargain that is sassy! Thanks for the Granville suggestion – I’ve grabbed the pattern and it is the next shirt in the queue!